What a better way than combining both. SUP Yoga is hugely beneficial for your health. It workouts all areas of the body and also helps bring a sense of calmness to your life which we all know is the real secret to a long, happy life! Don’t just listen to me either – celebrities are all over it too, like Lea Michele, Cameron Diaz and we know Matt Damon doesn’t mind a paddle so we wouldn’t be surprised if he tried a downward dog or two! So let’s take a closer look at what these health benefits are. 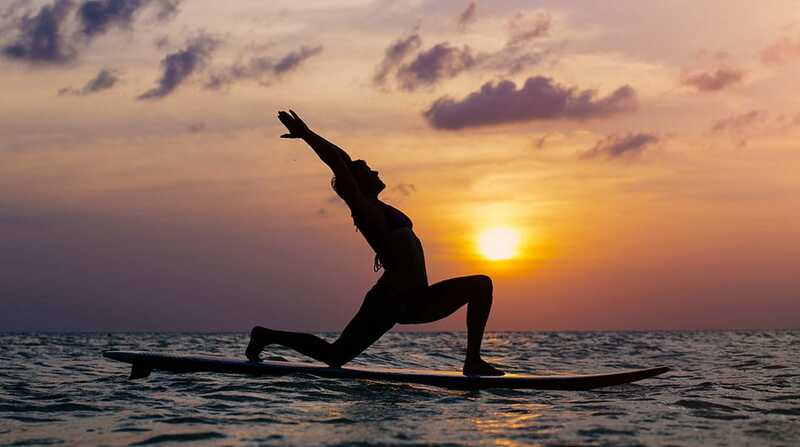 Part of the health benefits are in connection to the achievable weight loss, It’s estimated that an hour SUP Yoga practice can burn between 400-500 calories. For some, weight loss won’t be your goal but if it is, SUP Yoga is a gentle, friendly and fun way to get to your desired weight. It makes you feel good about yourself whilst losing the extra weight so the whole experience comes from a positive place. Not only can it help you be rid of extra kg’s but it tones your muscles. One of the healthiest ways to get into shape is through exercise that tones your muscles as opposed to builds them (in my opinion – I’m not a doctor! ha!). You strengthen more than the major muscle groups and it provides strength and power through movement rather than just building muscle so you can lift heavy things. Seeing as breathing is vital part of Yoga in aiding balance, it becomes essential with SUP Yoga! Learning to control and access stabilizing breath helps improve your cardiovascular system, enhances blood circulation and provides the control you need to stay on the board! Other health benefits behind breathwork include prevention of various diseases/ailments such as high blood pressure, stroked, varicose veins, heart diseases, kidney issues and aneurysms. To stabilize yourself with this breath work, you have to focus. Being able to calm all the crazies in your head to focus is hugely beneficial for all areas of life, it’s a kind of meditation! Focus draws in on our ability to handle all the emotional adversity that we are faced with day in day out. Practicing remaining calm in SUP Yoga (breathing to find balance as you fall like you are falling in) in amongst a storm will always seep out into other areas of life, it means less stress for you. Cortisol (stress chemical) is one of the unhealthiest things you can have in your body for prolonged periods of time. So preventive care is always best! There is a fantastic acronym for the 4 chemicals of happiness. D.O.S.E. That is Dopamine, Oxytocin, Serotonin and Endorphins. If happiness isn’t one of the biggest health benefits, I don’t know what is! These 4 chemicals that your brain releases are what make up our happy moments. So long as you are practicing SUP Yoga with someone else, you are getting all 4 happies! Let me explain. Dopamine – Occurs when you achieve a goal. Achieving a pose without falling off releases dopamine! Oxytocin – Is the “love” chemical. Makes you feel fuzzy and connected. When you are out with your buddy having a good time, that connection you feel is oxytocin! Serotonin – Is the regulator of moods. Too much or too little effects the way we feel. While most serotonin is made in the gut, exercise, particularly yoga helps boost serotonin levels to a healthy level. Endorphins – These guys are what keep us going when the going gets tough. Released in exercise to help mask the pain so we can keep going! It’s why after 10/15 mins of exercise you always feel like you can do more. Combine these 4 and you have an amazing workout leaving you sky high happy and ready to take on the world. Obviously, SUP Yoga helps with balance training! Balance may seem like an odd point to make in relation to health benefits. But hear me out. We require balance to do everything in our life, walk, sit, judge distance. Balance training promotes body awareness, that is, the sense of knowing where you are at all times. So you are aware of things around you and what level of effort you need to apply to avoid hurting yourself. For example when you need to jump out of the way of a flying ball. Being able to pride yourself on great balance is a rare and awesome attribute! Well by now you should be convinced about the health benefits of SUP Yoga. Now I will also let you in on a little secret – it’s fun too! Ha! Fun exercise, what a wonderful age we live in. Google “SUP Yoga classes” in your area, it’s becoming quite the trend so there’s a good chance someone’s already doing it! Attach some form of anchor – I use a rock and string – to your SUP. This means you don’t have to interrupt you Yoga practice to steer away from the shore. Then go out and give it a go! Check out “Fundamentals of SUP Yoga” for some more detailed descriptions of poses and selection of SUP’s that are as ideal for SUP Yoga as peanut butter is to jam. Another suggestion is to take some time for meditation after your stretching. Our brains can relax much easier when we’ve worked out our physical bodies. All it needs to be is some deep breaths, taking in the gentle sounds of lapping water and perhaps the wildlife like birds nearby. I personally love lying on my back and letting my fingers dip into the water as the current swirls me in different directions. Be sure to wear some swimmers, you may fall in while you are getting the balance, but perseverance is key here. It won’t be long till you are wowing the masses with your finesse and elegance aboard your SUP.